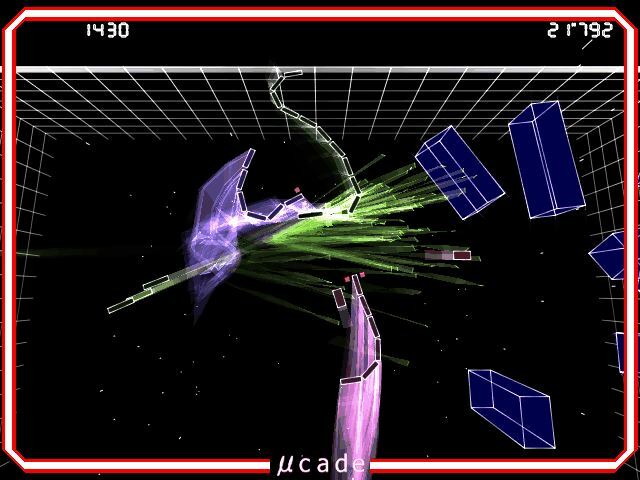 Mu-cade is a very unique shooter that is reminiscent of Centipede and the old classic Nibbles, with a healthy dose of smooth physics and King of the Hill gameplay. Keep from falling off the edges by pushing enemies off the playfield, either with bullets or your ever-growing tail. The physics engine allows you to use this tail in a variety of ways, and you can sacrifice your tail to wipe out enemy bullets and gain a little boost in shot power. However, keeping a long tail will give you large multipliers for points. How to extract: Download the ZIP package and extract to a folder of your choice. Launch mcd.exe. Nomltest FS is a very slick space shooter with an interesting mixture of old-school graphics and new-school effects. Features a unique "bullet eating system" which rewards the player for keeping themselves in dangerous situations. There are three different shot patterns (each with its own effect on the bullet eating range and ship speed) as well as a few unlockable modes. How to extract: Download the ZIP package and extract to a folder of your choice. Launch nomltest_fs.exe. How to extract: Download the ZIP package and extract to a folder of your choice. Launch iv.exe. Alternatively, you can play this game windowed by launching window.bat, or with different color schemes by launching grey.bat or blue.bat. WARNING: I startet iv.exe and got the "Press any Button"-screen. Then nothing happened no matter what I did. When I tried the Esc-key, my entire WinXP crashed down! @9k.lai You have to hit the "Z" button, not any key. (On qwertz keyboards "Y") That's all. Gunroar is a top-down shooter that lives up to its name. You pilot a boat and are pitted against boats of all strengths and sizes as well as mounted turrets. No real story, just adrenaline-pumping action which you can share with a friend in the Double Play mode. How to extract: Download the ZIP package and extract to a folder of your choice. Launch gr.exe. Tumiki Fighters is a side-scrolling shoot-em-up with a fun twist: the enemies you shoot down can be captured and added to your own arsenal, each of which gives you bonus points every second. The broken parts you collide with will stick to your ship and fire normally at your enemies, and also serve as extra layers of defense. There is also a "slow" key which reduces your movement and hides all attached pieces to prevent them from being destroyed. How to extract: Download the ZIP package and extract to a folder of your choice. Launch tf.exe.